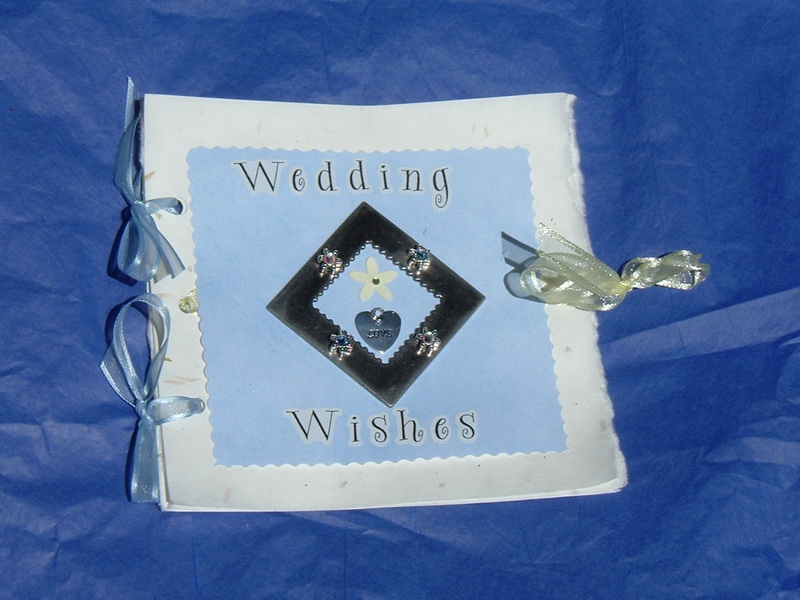 Here is a picture of one of the 8 guest books that I made for Paul’s and my wedding. Instead of one big guest book, we have one per table. They’re all different, but only slightly. I started with artist paper I got from Michaels craft store. It’s called “harvest” because it has brown seeds in it. They also have a busier version of harvest and a few with purple petals and seeds in them, but I wanted something subtle for the books so that printed letters wouldn’t disappear when written over a darker petal. The pieces come in huge 19″x25″ sheets, so the first step was cutting the 6″x6″ pages. I held the artist paper horizontally, then measured and cut 6″ horizontal strips (and wasted about an inch on top). To get the deckled edge (handmade paper is known for deckled edges, so I thought I’d make it a bit handmade-looking and include this), I measured 6″ widths on the strips of paper and drew a faint pencil line. Then I took a wet paintbrush (really wet, because I wanted to let the water soak into the paper) and ran it up and down the line. I did this with a strip or two, then tore along the wet parts to get the nice edge. Because I had cut the top and bottom with scissors, they’re even (so the book can stand up on even edges when the pages are splayed). And I used the deckled edge for the outside (right side) ofthe pages in the book. Only half of the pages have deckled left sides because that was the edge of the paper, but I put them in the binding so you can’t really tell. Paper sized, I now made the covers. I cut out 8 different scrapbook papers I had bought (this is part of the differentiation between each book) into 4″x4″, so an inch of the artist paper would show through on each side. I used 4 different cuts (with those funky-cutting scissors you can get in just about any craft store for under $2 each) on the 8 papers — 2 pages of each cut. Cover done. Now to bind the book. I used a method I use with my Christmas Carols book (another post entirely! ), namely thread ribbon (the carols book uses yarn, but you get the point) through punched holes. I could have done only 2 holes, but then I wouldn’t have had the middle ribbon to tie the book together. The middle yellow ribbon is, obviously, an optional bit. It just adds a bit to the book, I think, and balances the aesthetics with the ribbons. I got matching ribbon in both light blue and yellow (the wedding colors) and tied the blue through the punches (not tight, or you won’t be able to open the book or lay it flat when you do). The yellow is glued with two small dabs on the back of the book, allowing for slack so that when you open the book it doesn’t cinch in the middle. Some of the books has the yellow ribbon on top of the paper on the cover, for a horizontal design element, and some has it run behind the paper so it’s barely visible from the hole on the left and then appears again just in the bow to close the book. Full disclosure: I got the basis of this design from a craft book and sketched it out. Then I added things like the Swarovski crystals and deckled edges (can’t remember if that was part of the book’s design or not, actually). I also changed the binding of the book, as the original design had it be an accordian, which I didn’t particularly like, with just the one middle ribbon. I made each page separate and added the two blue ribbons. I can’t remember the name of the book, but it was something obvious like Wedding Crafts or something like that.